Aid agencies in the Sudanese region of Darfur say they are alarmed by a sharp escalation in sexual attacks on displaced women and young girls. 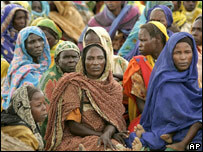 The International Rescue Committee (IRC) has warned that in Darfur's biggest camp for displaced people, 200 have been raped in the past five weeks. It says this signals a rapid deterioration in terms of security. 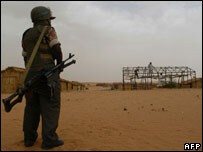 Meanwhile, Sudan's ruling party has rejected a draft UN resolution on sending peacekeepers to Darfur. "The draft resolution is worse than previous ones as it is an attempt to impose complete tutelage on the Sudan," National Congress Party chairman Ghazi Salah Eldin Atabani was quoted as saying after a meeting on Wednesday. "Any state that sponsors this draft resolution will be regarded as assuming a hostile attitude against the Sudan," he said. The draft was sponsored by the US and the UK, which want the UN to take charge of the peacekeeping mission from the cash-strapped African Union. The IRC is calling on African Union forces to bolster patrols, although these have had to be scaled down. In Kalma - Darfur's biggest camp for internally displaced people - there used to be two to three reports of sexual violence a month, the IRC says. But in the past five weeks, the figures has spiralled to 200 women and young girls, some as young as 13. It is yet further evidence, relief workers say, that security is worsening in one of the most troubled regions of the world. There has also been an escalation of attacks against humanitarian aid workers, some of whom have had to cease operations. A peace deal was signed last May between the government of Sudan and a faction of the Sudan Liberation Army rebels, yet the bloodshed continues to force tens of thousands of people to seek refuge in camps. Relief workers say women have become more vulnerable to assault because they have to leave the camp to search for firewood and African Union patrols, once a key part of the AU mission in Darfur, have been slimmed down due to lack of resources. Some two million people have fled their homes in the conflict, which began in February 2003, when Darfur rebels took up arms, accusing the government of ignoring the region.